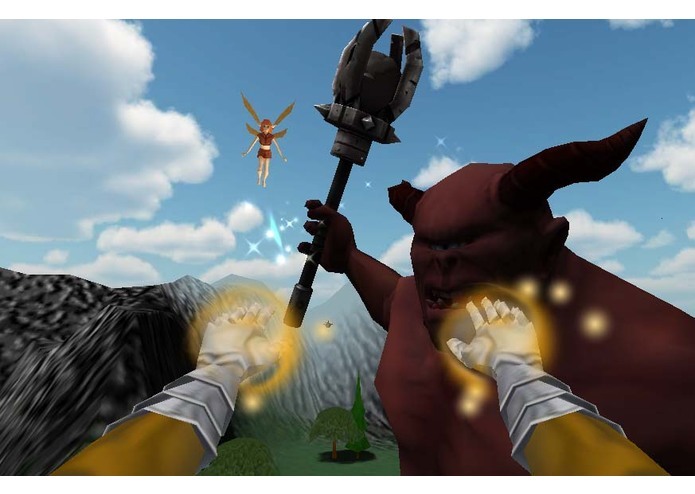 Think super hard VR fantasy shooter...with a buddy who helps you spot the baddies. 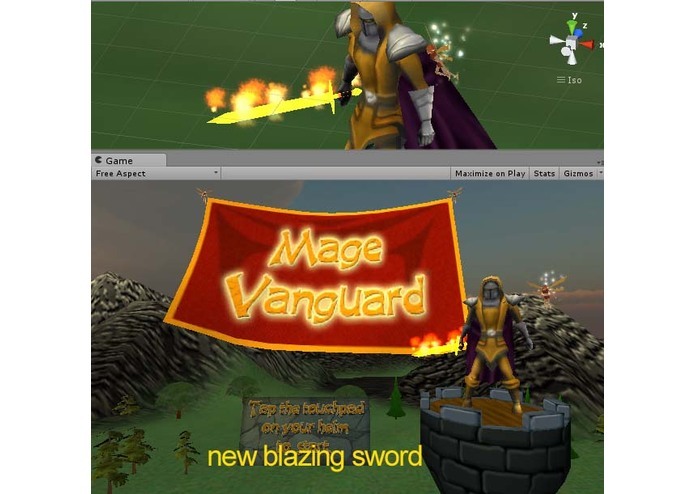 Mage Vanguard started as a VR Game Jam entry... I made all four milestones, and am continuing development. I wanted the environment to be richer, so I made some rocky cliffs, new trees, a waterfall, custom animated water etc... the mage sanctuary. 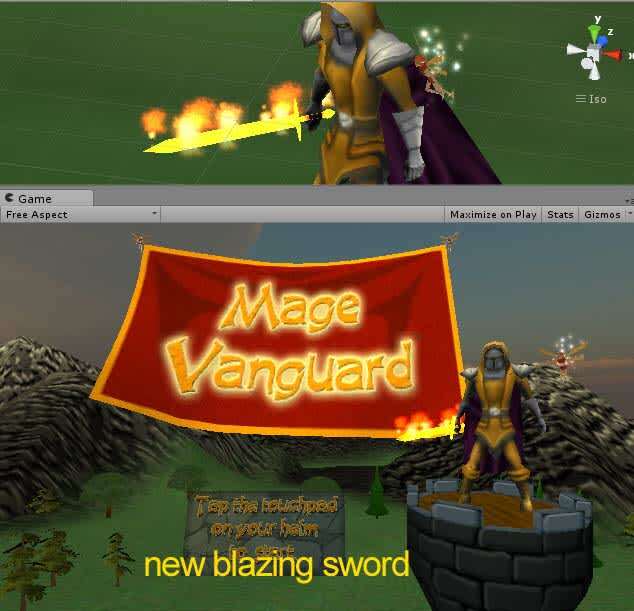 A quick visual creation of a blazing magic sword has been created. Swipe code integration coming for melee and other spells. Working on it. Swipe down, materializes blazing sword. Priorities include the following: optimization, improving gameplay with more spells, more enemies and boss fights, and developing the art more. I experimented with lightmaps a bit more. 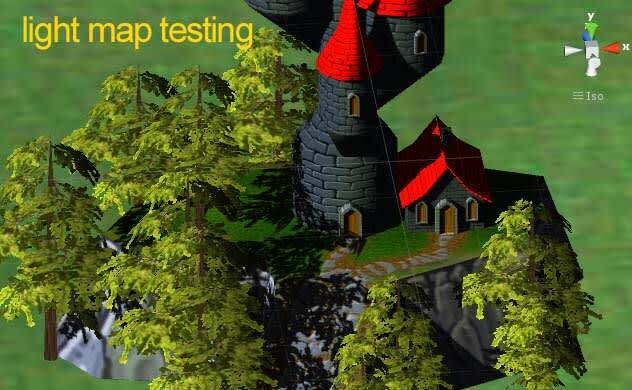 I have to research issues of defining prefabs with lightmaps and the prefab not storing lightmaps. (This issue is why the gameworld has a lightmap and the title world does not in the VR Jam entry. I'll work it out... though light maps are ballooning up the file size. Main camera is now animated with an "ease to" final position element so that the user is not jarred when it stops. Milestone 4 Be the mage. 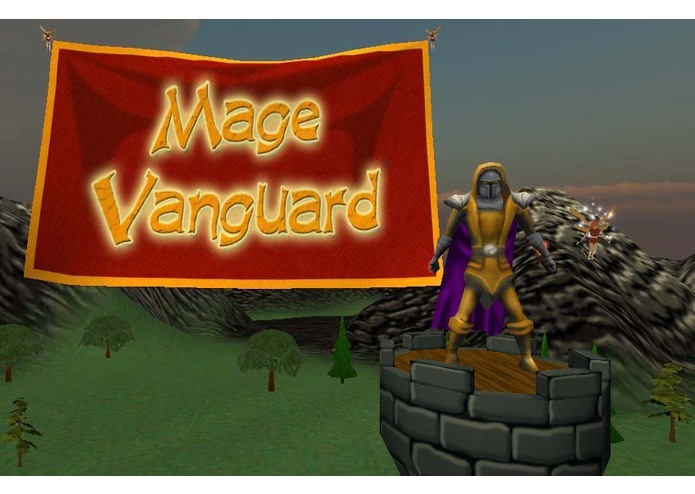 in Mage Vanguard (Think super hard VR shooter. (Skip the first paragraph below if you, as mage, need little motivation to blast foes attacking your keep.)) The vampire king, Count Drakar, has amassed an army from the nether world. Drakar is attempting to reclaim land taken from him by the Realm of Pelinore a century before. Drakar is bent on first destroying the king's most powerful mage, you. Can you defend your keep against the minions of Drakar? 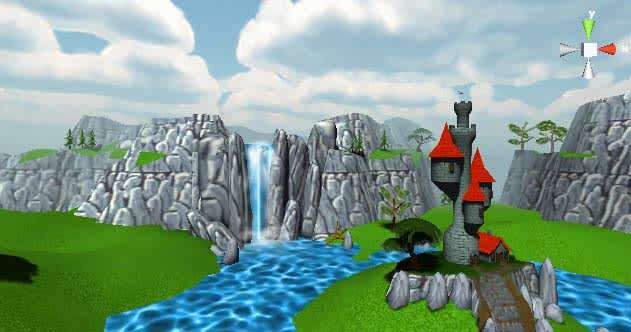 I made this game as a lone developer (design, code, and a lot of 3D art (main character, keep, fairy, terrain, vegetation)), and also helped out on another VR team project. It was extremely challenging, and I loved every minute of it. My game uses a combination of touch pad (swipe and tap) and gaze input. Players can select to either tap or swipe the touch pad to launch projectiles at the many foe. To make interaction easy on the user, I stripped the UI down to its essence. Giving all the graphics another iteration, boss fights, many spells, a choice between at least two helpers. and more enemies-- I wanted to get all this in there, but alas I'm one developer. It's coming, but I've been up all night the last hours of the jam (and working late in the night for weeks)...so give me some time to sleep. Onward. Give it a go. It's fun. (I decided in the end to go with fantasy instead of sci-fi theme.) Milestone 1 Hyperwingshot will be a gaze shooter with an intense/frantic pace. My main goal is to create a virtual reality gaze shooter that has a certain...wow factor. We'll see. A lot of the details are to be determined. Milestone 2: Hyperwingshot is moving forward at a good pace. A prototype is done. Unity makes it a breeze to do. I'm looking forward to bringing the world to life. Milestone2: Done: Projectile code with tap. Projectile prefab. Dummy targets. Viewpoint/weapon setup. Much fun was had making this so far. More to come. Onward. 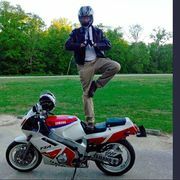 I served as game designer, coder, 3D artist, 2D artist, sound guy, yada, yada. I created the main character, the fairy, the keep, terrain, trees, etc... I coded enemy ai/ weapon code etc... Wearing all the hats was challenging, but also fun. 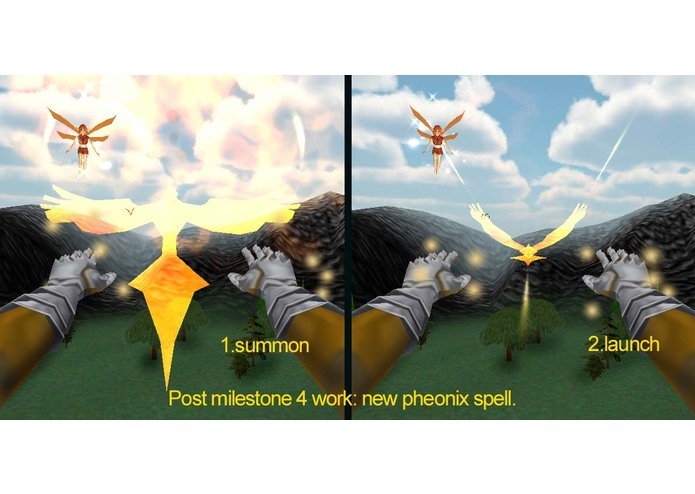 I look forward to making many many improvements-- more spells, boss fights, another go at all the graphics, etc... all with the hope of getting it in the Samsung Gear VR store. If I win any money from the Jam, it will be put towards getting some programming assistance so that I can focus on enhancing all the art. 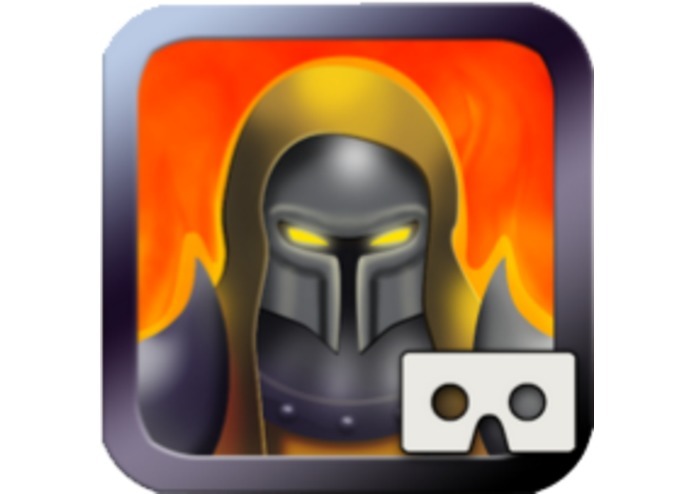 VR Mage Vanguard is now a Google Cardboard App available to download!!!!! Yeah!